Going, going, gone. 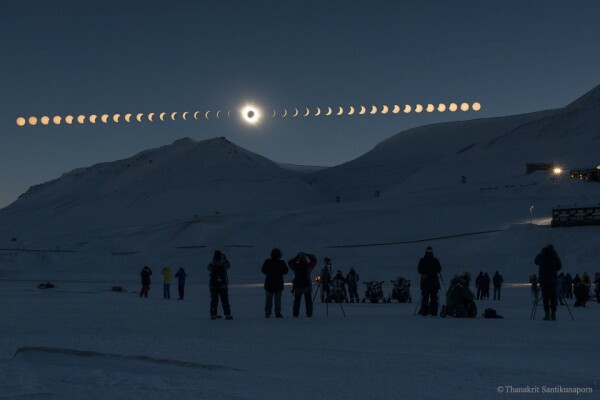 That was the feeling in Svalbard, Norway last month during a total eclipse of the Sun by the Moon. In the featured image, the eclipse was captured every three minutes and then digitally merged with a foreground frame taken from the same location. Visible in the foreground are numerous gawking eclipse seekers, some deploying pretty sophisticated cameras. As the Moon and Sun moved together across the sky — nearly horizontally from this far north — an increasing fraction of the Sun appears covered by the Moon. In the central frame, the Moon’s complete blockage of the disk of the Sun makes the immediate surroundings appear like night during the day. The exception is the Moon itself, which now appears surrounded by the expansive corona of the Sun. Of course, about 2.5 minutes later, the surface of the Sun began to reappear. The next total eclipse of the Sun will occur in 2016 March and be visible from Southeast Asia.